SueBee and Kat is three months old. Launched with WordPress on September 1, 2013, we’re simply giddy to have made it this far! We’ve posted 108 times, more than once daily, and are super proud the blog is a complete, 100% reflection of us and our activities… exclusively our photos, and stories of places we’ve been. Images of SoCal (gallery comprised of photos we’ve taken throughout Southern California, featured in previous articles, by month). Foto Fix Gallery (a collection of our Daily Foto Fix pictures). Blogging is a lot of work, we can’t deny that. The first two weeks were spent figuring out WordPress, choosing a theme, then buying a new theme, switching over, and then figuring that out. Next was trying to develop a following… that’s been a fun, exhausting process. We’ve enjoyed meeting other bloggers online, and are in awe of the wide-range of talent out there. Feeling sad that some people seem to click “like” without bothering to read the article or look at the pictures. I mean seriously, we uploaded a post having nearly 20 pictures and a decent length article. Literally within seconds of posting, we had 5 likes… how is that even possible, except people seeing it pop up in the newsfeed and feeling inclined to click “like”. My son suggests removing the “like” button. He insists we shouldn’t care whether people “like” a post or not, but with WordPress, that’s how it determines popular posts for one of the widgets…. so, we’re leaving the like button for now. Note: we have WordPress set so a preview is all that shows in the newsfeed… readers must click to visit our site and read the full article. Haven’t figured out how to batch re-size our photos yet… re-sizing is therefore time consuming. Dislike the newsfeed (Reader) idea. When Kat and I visit blogs of others, we go to their site. We enjoy seeing the creativity they’ve used, the various themes, layouts. We both dislike the impersonal nature of the newsfeed, although we can see its purpose in some ways. Now that we’re in the groove with WordPress, posting is a fairly smooth process. Documenting our ‘out and about’ activities, it’s fun to look back on, like a living journal. Having a reason for all the gazillion photos we take! Satisfaction in feeling like maybe we’ve inspired others to visit some of the places we’ve been. Have enjoyed feedback and comments from others. ← Paradise beckons yet again! This ppost actually made my day. You cann’t imagine just how much time I had spent forr this info! Boy! That’s prolificacy! Might be too fast, don’t you think? Oh well, it’s your blog, your style. 😀 Just saying that I’m nearly 3 years and I have 243 posts so far. 😉 I like because I like a post. I comment because I have something to say. :D. Keep up the great work, Suebee. I can tell the blog is very promising. I’ll be back in SoCal in February. Hi SueBee and Kat, congratulations on your blog! You have just started blogging, but it looks as if you’ve been around forever. Your pictures are great, and so is your entire site, but that’s not what calls my attention the most about you. What I believe makes you stand out is your spontaneity and straightforwardness, which are reflected in your talent as photographers, your pieces of writing, and your warm, welcoming comments. Thank you so much for enriching my blogging experience. 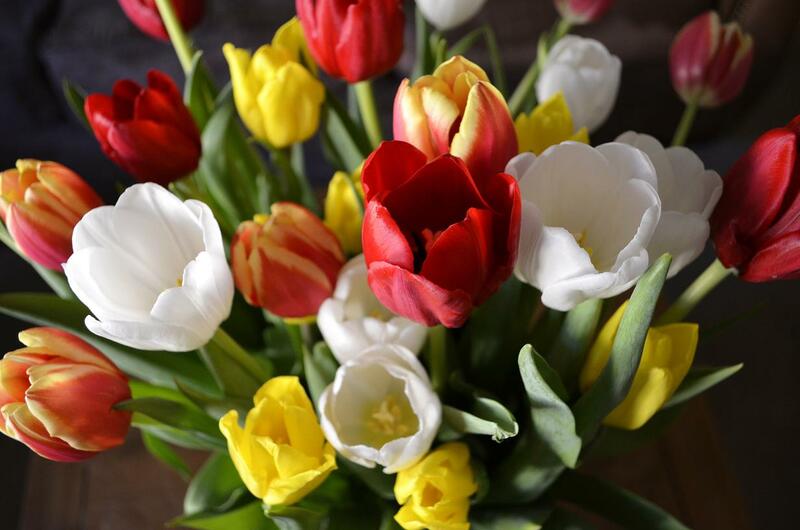 I love tulips, thinking of spring already? Congrats on the milestone!